Known locally as Gunkanjima or Battleship Island, Hashima was once home to a bustling coal mining town. As demand shifted from coal to petroleum, the island was abandoned, and has been uninhabited since 1974! These modern ruins and testament to nature's power stand as both a living part of recent history and an overwhelming monument to time. The island's legacy is still felt, and directly inspires movies, such as the recent Bond film Skyfall! English language audio guide is available for free, however, English speaking guides are not. Children under 3 years old are not permitted to join. Start learning about Hashima Island with materials documenting actual daily life, including videos, pictures, and mock-ups for 30 minutes before departing. The guides are also happy to share their in-depth knowledge! From aboard ship, see some of Nagasaki's most historic spots, including the original area of Dejima, Japan's first bridge to outside trade. See the high rise apartments soar from the island and enjoy a rare view of the western side of Hashima. Disembark on Hashima and take the special tour of the reconstructed area, rebuilt for safety. If using the expressway, please use the Nagasaki Dejima Road exit, then take the first left at the signal, and head towards Glover Garden. About 300 meters ahead is the Ourakaigandori Street tram station, with a Gusto restaurant on the corner. 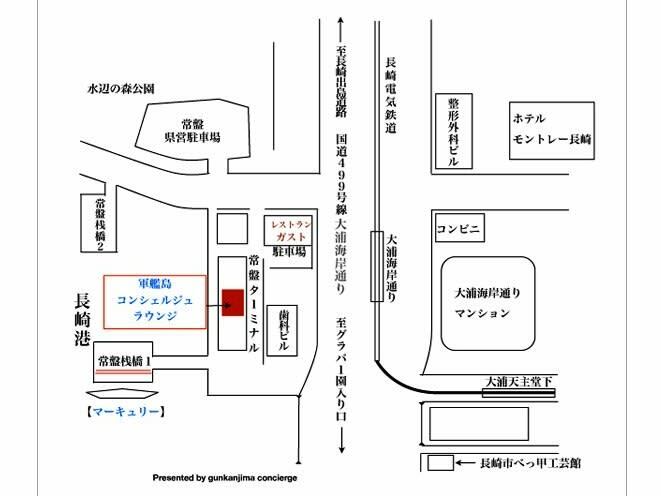 Please turn right at the Gusto, and park in the Tokiwa Prefectural Parking area on your right. Parking fees are 120 JPY / 30 minutes. Please use street tram number 1, for Syokakujishita, and disembark at Tsukimachi after receiving a transfer ticket. Then board tram 5, from the opposite side of the platform, heading for Ishibashi. Disembark at Ourakaigandori Street, 2 stops away from Tsukimachi, and head for the Gusto restaurant, which is directly in front of the Tokiwa Terminal. Get on bus number 30 or 40 from the South Exit of Nagasaki Station. (Across the street from Hotel New Otani). After getting off at "Glover-en iriguchi" stop, walk about 30-seconds. From Nagasaki express way, take the Nagasaki Dejima road, bound for Oura Church. Get off at "Oura Tenshudo shita" station and walk 1-minute. From aboard ship, see some of Nagasaki's most historic spots, including the first hammer head crane in Japan that still works today! Upon entering the Iojima terminal, head toward the restroom to go to the lounge. Due to weather and safety reasons, there may be cases you will not be able to go to Hashima Island. In the case your tour is cancelled, there will be no refunds, however you will receive a free souvenir. Signing a safety document is necessary to participate in the tour. You may prepare the document ahead of time, or on the day of the tour. Leaving the tour area is dangerous, and is not permitted. You will be able to view the high density high-rise apartments from the ship. You must listen to the guides' and safety staff's instructions while on Hashima Island. Due to the narrow pathways on the island, stopping to take pictures outside of specified areas is prohibited. Depending on weather and safety conditions, it may not be possible to dock and disembark on Hashima Island. Should departing the harbor be unfeasible, an alternate tour of Nagasaki will be arranged, with explanations of Hashima Island included. This is a map of Hashima Island. The red line represents the tour area, with three observation areas. One Japanese-speaking guide will be on board and English audio guides will be available for rent for free.